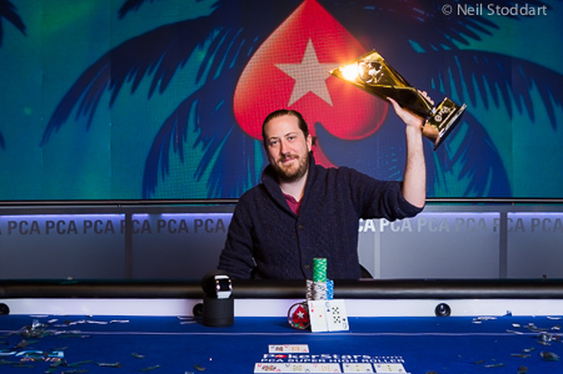 Steve O'Dwyer has claimed the first major poker title of 2015 by defeating all comers in the PCA's $100,000 high roller event. Despite entering the final table in the shadow of Sorel Mizzi, O'Dwyer managed to rally himself and come from behind to walk away with the winner's trophy and $1,872,580. Having attracted 66 entries across two days, the $100,000 event's finale got underway last night with some of the game's finest high rollers in contention. Flanking Mizzi and O'Dwyer was the likes of Bryn Kenney, Christoph Vogelsang, Sam Greenwood and Scott Seiver. However, as the session wore on and pressures mounted, the plucky pros gradually slipped away to leave O'Dwyer and the relatively unknown Roger Sippl fighting for the top prize. Unfortunately for Sippl, O'Dwyer held a comfortable chip lead at the start of play and didn't let up throughout the entire match. After gradually wearing his opponent down, O'Dwyer eventually brought the hammer down and caught his opponent bluffing on a Qh 8d 8c 2s board with Js Td. Despite only holding Ah Tc, O'Dwyer called Sippl's all-in and scooped the title after the 3s landed on the river. "I'm pretty confident about what I've been doing lately, but a lot of this is luck and I ran pretty hot to win another one. Players are a lot tougher in these ones so it's better to get lucky I guess." Image courtesy of Neil Stoddart @ PokerStars.